Hér sést Dwight Eisenhower, hershöfðingi og síðar Bandaríkjaforseti, á Reykjavíkurflugvelli ásamt Bjarna Benediktssyni, þáverandi utanríkisráðherra Íslands. Það er 25. janúar árið 1951, og kalda stríðið er í algleymingi. 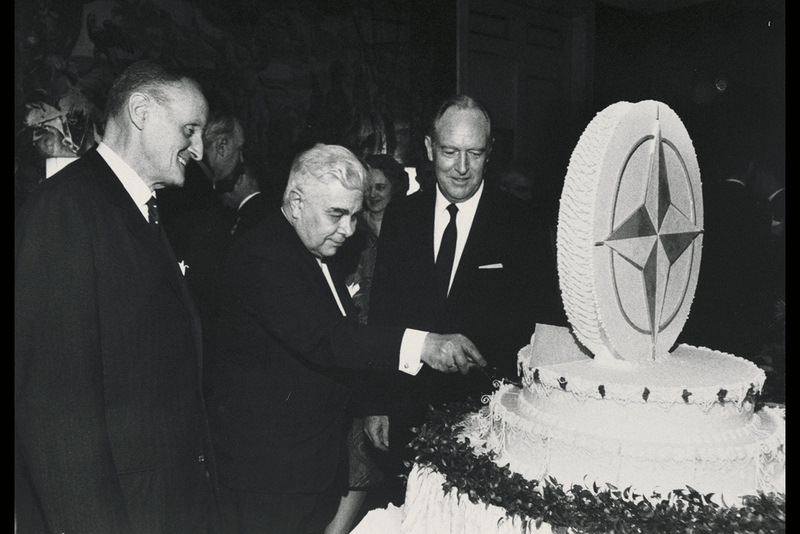 Eisenhower er á þessum tíma yfirmaður Evrópudeildar NATO-varnarsamstarfsins. Af hverju er hann kominn til landsins og hvað vakir fyrir honum? Tveimur árum áður, þann 30. mars 1949, þrátt fyrir fjöldamótmæli og átök við Austurvöll, hafði Alþingi samþykkt lög sem gerði Ísland eitt af stofnríkjum Norður-Atlantshafsbandalagsins. Þetta nýlega sjálfstæða eyríki var á lykilstað milli austurs og vesturs, og sérlega vel staðsett til þess að fylgjast með kafbátaumferð í Norður-Atlantshafi. En ólíkt á hinum Norðurlöndunum voru kommúnistar sterkir á Íslandi. Sósíalistaflokkurinn hafði hlotið um 20% atkvæða á landsvísu í kosningunum 1949, og var með enn meira fylgi í Reykjavík. Eisenhower var kominn til landsins með viðkvæmt verkefni: að fá samþykki íslenskra ráðamanna um varanlega viðveru bandarískra hermanna á Íslandi. Lemúrinn hefur grafið upp gamalt leyniskjal NATO (PDF, á ensku) þar sem greint er frá þessari heimsókn Eisenhowers. Skjalið er samantekt Lanson ofursta á því sem fram fór og segir ítarlega frá samræðum hershöfðingjans við íslenska ráðamenn. Það sat ósnert í skjalasafni NATO í rúm 60 ár og varð fyrst aðgengilegt almenningi árið 2012. Þar er greint frá tveimur fundum Eisenhowers við þáverandi ríkisstjórn landsins. Á fyrri fundinum stiklar Eisenhower á stóru, segir að smáþjóðir geti einnig gert sitt fyrir varnarsamstarfið, og að frjálsu þjóðir Evrópu þurfi að standa saman gegn ógninni í austri. Íslenskir ráðamenn fullvissa hann um að einungis kommúnistarnir séu andsnúir aðild Íslands að varnarsamstarfinu. Þeir séu hins vegar með mikið fylgi, lúti yfirboðurum sínum í Sovétríkjunum, kyndi undir þjóðerniskennd landsmanna og saki Bandaríkin um heimsveldisáform. Bjarni og afmælisterta NATO 1969. Á seinni fundinum segir Bjarni Benediktsson að fámenn, fátæk og afskekkt þjóð geti þó gert sitt fyrir varnarsamstarfið, og ef það kæmi til stríðs myndi Ísland gegna sínu hlutverki. Ógnin sem stafaði af Sovétríkjunum væri skýr og þjóðin væri nú tilbúin til þess að fallast á viðveru herliðs í landinu á friðartímum. Það væri að sjálfsögðu best, segir Bjarni, ef varnir landsins væru í höndum íslenskra hermanna, en íslenska ríkið hefði hreinlega ekki efni á að halda uppi þeim þrjú þúsund mönnum sem yfirstjórn NATO teldi nauðsynlega. Þjóðin væri hins vegar nýlega orðin sjálfstæð og myndi líta illum augum allt sem græfi undan fullveldi hennar. Eisenhower lofar að Íslendingar þurfi ekki að hafa áhyggjur af slíku, og að samstarfið muni ganga smurt fyrir sig með góðum vilja beggja aðila. Lemúrinn birtir hér textann í fullri lengd. Ljósmyndir af upprunalega skjalinu eru neðst á síðunni. 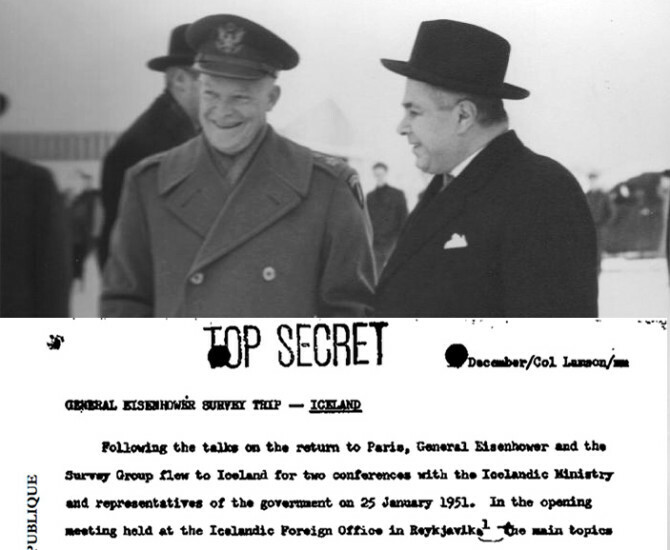 Following the talks on the return to Paris, General Eisenhower and the Survey Group flew to Iceland for two conferences with the Icelandic Ministry and representatives of the government on 25 January 1951. 1 From 1230 to 1315 hours. Present were: General Eisenhower, General Gruenther, Mr. Douglas MacArthur II, Mr. Lawson, American Minister, Prime Minister Steinthorsson, Foreign Minister Benediktsson, Finance Minister Jonsson, Minister of Fisheries Thors, Minister of Agriculture Jonasson, Minister of Commerce Olafsson, Secretary General of the Foreign Ministry Klemens-Jonsson, Legal Advisor of the Foreign Ministry Andersen. In the opening meeting held at the Icelandic Foreign Office in Reykjavik, the main topics of discussion were General Eisenhower’s views of the situation in Western Europe and Communism in Iceland — and in Europe. After a warm welcome by Prime Minister Steinthorsson, General Eisenhower spoke of the contribution that each NATO country must make to the defense of the free world and said that small countries can make just as great a contribution as large countries in courage and determination to remain free. 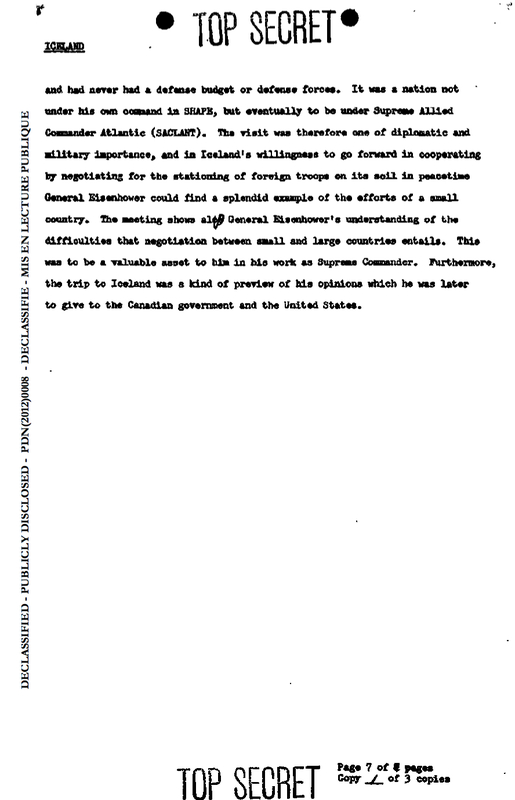 In answer to a request from Foreign Minister Benediktsson for his impressions of his tour and of the problems he envisaged in building up European defense, General Eisenhower gave a very effective short review of the situation he had found. He pointed out that the building of adequate defensive strength was complicated by a number of interrelated internal problems in each country. Where fear is prevalent, there is reluctance to build defensive strength because some people believe it might provoke hostile reaction from the east. Some countries face the problem of internal security because of a Communist fifth column. The exhaustion of national resources as a result of the late war causes economic and financial problems. Another complication may result from the multiplicity of political parties, making it difficult to reach agreement on an effective course of action which would require effort and sacrifice. These different factors have combined to cause a state of fatigue and exhaustion — physical and psychological — in a number of European countries. However, General Eisenhower said that he had detected a growing will and determination to move forward and make the necessary effort. There was also, he believed, a growing spirit of unity among the NATO countries. The people of the free world are at bottom aware that the spiritual and material values which they hold so dear will all be lost if they do not attain security. General Eisenhower reported that he found the situation in Europe considerably improved over that which he understood existed a year ago. Economic conditions had improved and Europe could now feel that the difficult task of defense could be accomplished. In his report to the U.S. Government General Eisenhower said he would give his honest impression of what he had found, including his view of the defense program of the countries, their requirements and deficiencies, and the degree of their determination. He emphasised his opinion that the building of defensive [strength] was vital to our freedom and that the NATO countries had no aggressive aims or intentions of any kind. The sole object of defensive strength, he said, was to obtain security, defense, and freedom. 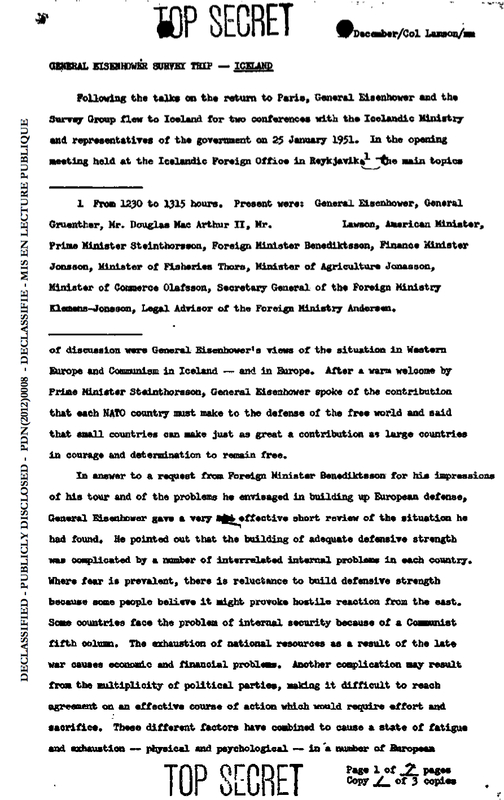 General Eisenhower asked if Foreign Minister Benediktsson could explain the reason for Communist strength In Iceland. The Foreign Minister replied that there were a number of interrelated reasons. 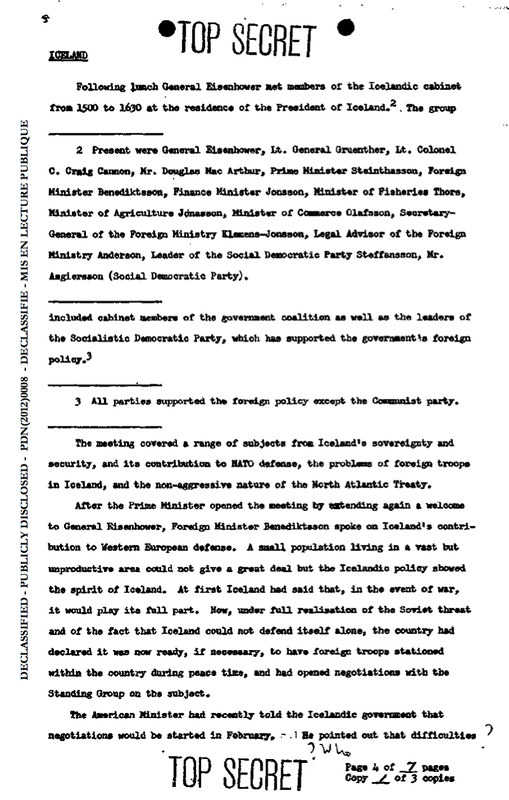 Despite the activities of the Icelandic Communist Party, many Icelanders feel that the Soviet Union is too far away to constitute a real threat or danger to Iceland, Furthermore the Communist party plays upon the strong feeling of nationalism in Iceland by attacking the United States and accusing it of imperialistic designs on the country. The Communists gain some help from fellow travelers and neutralists. Communist demonstrations in the past had included storming the cabinet ministers when Iceland joined the North Atlantic Treaty. 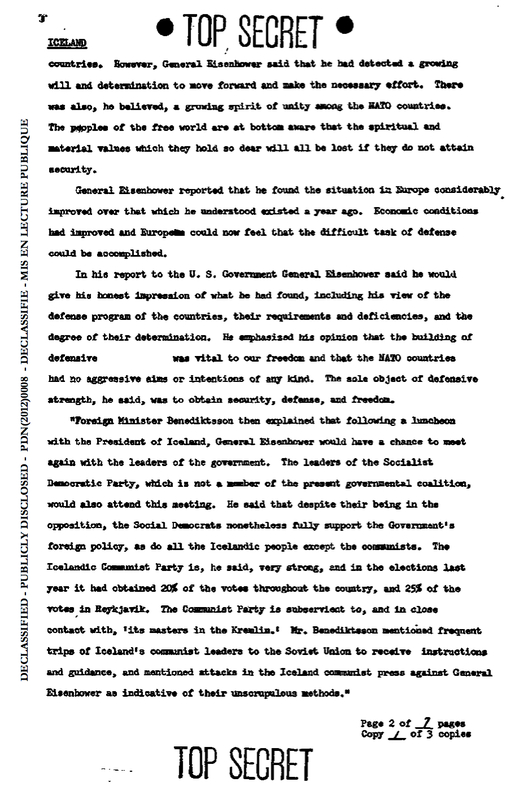 Foreign Minister Benediktsson asked General Eisenhower whether the Communists were gaining or losing strength in France and Italy. General Eisenhower replied that the government leaders with whom he had talked assured him that the Communists were losing in strength and influence. He mentioned that the Communist demonstration in Paris last night against him had been apparently a failure. He said that in the countries which he visited, he gathered the impression that most governmental leaders did not believe the Soviet Union planned on going to war in the near future, but they were aware that there was always a chance that some spark could touch off an explosion and therefore that every effort should be made to avoid such a spark. General Eisenhower said that he had found strong determination in France, Italy, Belgium, Holland, Norway and other countries to resist Soviet aggression. He mentioned the determination of Norway in particular, who had so recently suffered a severe occupation under the Germans. In reference to Germany, General Eisenhower said he felt there was a general belief that Germany should regain a position of respectability in the free world. 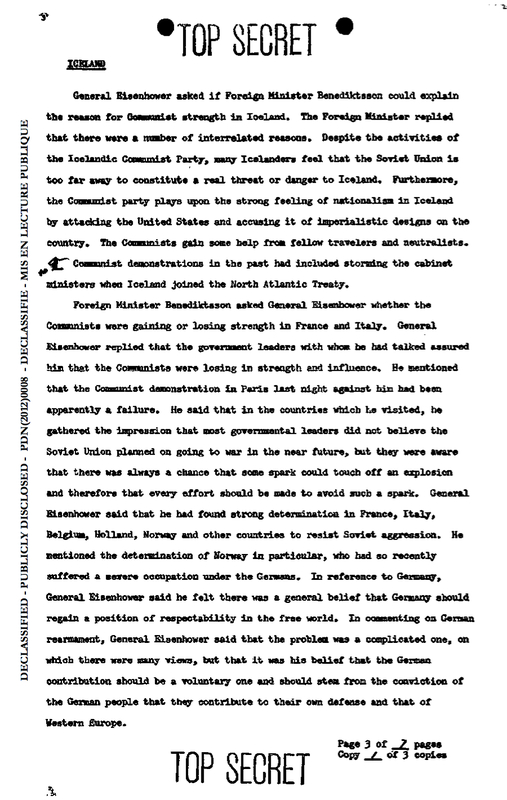 In consenting on German rearmament, General Eisenhower said that the problem was a complicated one, on which there were many views, but that it was his belief that the German contribution should be a voluntary one and should stem from the conviction of the German people that they contribute to their own defense and that of Western Europe. Following lunch General Eisenhower met members of the Icelandic cabinet from 1500 to 1630 at the residence of the President of Iceland. Present were General Eisenhower, Lt. General Gruenther, Lt. Colonel C. Craig Cannon, Mr. Douglas MacArthur, Prime Minister Steinthorsson, Foreign Minister Benediktsson, Finance Minister Jonsson, Minister of Fisheries Thors, Minister of Agriculture Jonasson, Minister of Commerce Olafsson, Secretary General of the Foreign Ministry Klemens-Jonsson, Legal Advisor of the Foreign Ministry Anderson, Leader of the Social Democratic Party Steffansson, Mr. Asgeirsson (Social Democratic Party). The group included cabinet members of the government coalition as well as the leaders of the Socialistic Democratic Party, which has supported the government in foreign policy. All parties supported the foreign policy except the Communist party. The meeting covered a range of subjects from Iceland’s sovereignty and security, and its contribution to NATO defense, the problems of foreign troops in Iceland, and the non-aggressive nature of the North Atlantic Treaty. After the Prime Minister opened the meeting by extending again a welcome to General Eisenhower, Foreign Minister Benediktsson spoke on Iceland’s contribution to Western European defense. A small population living in a vast but unproductive area could not give a great deal but the Icelandic policy showed the spirit of Iceland. At first Iceland had said that, in the event of war, it would play its full part. 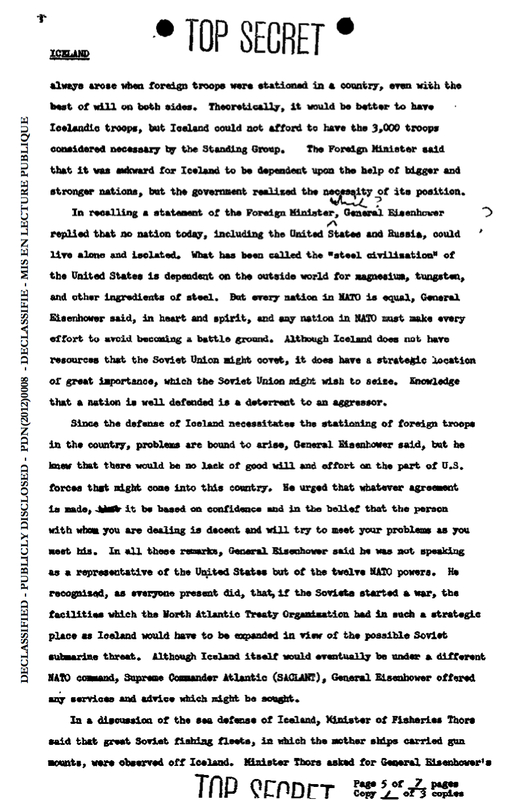 Now, under full realization of the Soviet threat and of the fact that Iceland could not defend itself alone, the country had declared it was now ready, if necessary, to have foreign troops stationed within the country during peacetime, and had opened negotiations with the Standing Group on the subject. The American Minister had recently told the Icelandic government that negotiations would be started in February. He pointed out that difficulties always arose when foreign troops were stationed in a country, even with the best of will on both sides. Theoretically, it would be better to have Icelandic troops, but Iceland could not afford to have the 3,000 troops considered necessary by the Standing Group. The Foreign Minister said that it was awkward for Iceland to be dependent upon the help of bigger and stronger nations, but the government realised the necessity of its position. In recalling a statement of the Foreign Minister, General Eisenhower replied that no nation today, including the United States and Russia, could live alone and isolated. What has been called the „steel civilization“ of the United States is dependent on the outside world for magnesium, tungsten, and other ingredients of steel. Not every nation in NATO is equal, General Eisenhower said, in heart and spirit, and any nation in NATO must make every effort to avoid becoming a battle ground. Although Iceland does not have resources that the Soviet Union might covet, it does have a strategic location of great importance, which the Soviet Union might wish to seize. Knowledge that a nation is well defended is a deterrent to an aggressor. Since the defense of Iceland necessitates the stationing of foreign troops in the country, problems are bound to arise, General Eisenhower said, but he knew that there would be no lack of good will and effort on the part of U.S. forces that might come into this country. He urged that whatever agreement is made, it be based on confidence and in the belief that the person with whom you are dealing is decent and will try to meet your problems as you meet his. In all these remarks, General Eisenhower said he was not speaking as a representative of the United States but of the twelve NATO powers. He recognized, as everyone present did, that, if the Soviets started a war, the facilities which the North Atlantic Treaty Organisation had in such a strategic place as Iceland would have to be expanded in view of the possible Soviet submarine threat. Although Iceland itself would eventually be under a different NATO command, Supreme Commander Atlantic (SACLANT), General Eisenhower offered any services and advice which might be sought. In a discussion of the sea defense of Iceland, Minister of Fisheries Thors said that great Soviet fishing fleets, in which the mother ships carried gun mounts, were observed off Iceland. Minister Thors asked for Geoeral Eisenhower’s valuation of this fleet as a threat, to which the General replied that he was not in a position to give such an evaluation, but that there were qualified NATO naval staff officers who could. He would upon his return to Washington call Admiral Fechtler’s attention to the matter. General Eisenhower suggested that the Icelandic government study civilian defense organizations which had been established by other governments, especially the United Kingdom. At this point Mr. Stephan Stephansson of the Socialist Democratic Party gave his statement in which he said that, although the Icelandic labor party does not support the government, it does heartily support the government’s foreign policy. In his opinion, the so-called policy of neutrality was the worst possible policy for Iceland. He said that Iceland and the United States have many things in common, that Iceland must ally itself with other people who believe in the same concepts of defense. In commenting again on the coming negotiations regarding the stationing of North Atlantic Treaty forces in Iceland, Foreign Minister Benediktsson said that a nation which had acquired its independence only in 1944 would be concerned over any infringement of its sovereignty. 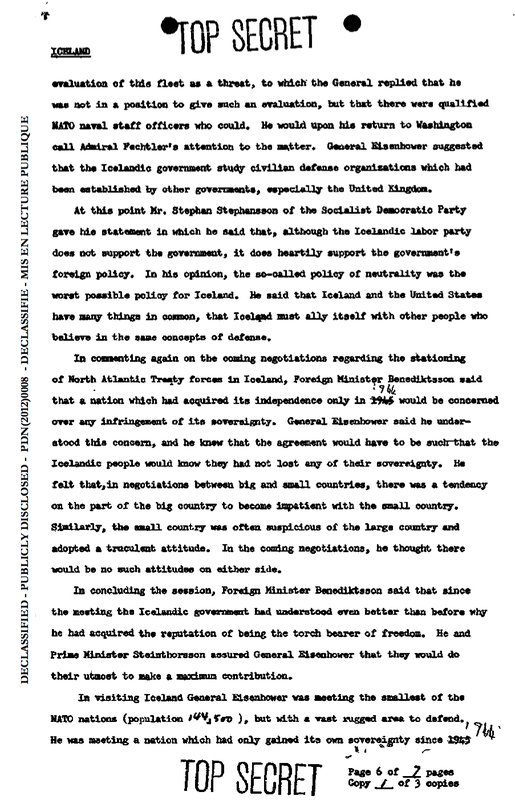 General Eisenhower said he understood this concern, and he knew that the agreement would have to be such that the Icelandic people would know they had not lost any of their sovereignty. He felt that, in negotiations between big and small countries, there was a tendency on the part of the big country to become impatient with the small country. Similarly, the small country was often suspicious of the large country and adopted a truculent attitude. In the coming negotiations, he thought there would be no such attitudes on either side. In concluding the session, Foreign Minister Benediktsson said that since the meeting the Icelandic government had understood even better than before why he had acquired the reputation of being the torch bearer of freedom. He and Prime Minister Steinthorsson assured General Eisenhower that they would do their utmost to make a maximum contribution. In visiting Iceland General Eisenhower was meeting the smallest of the NATO nations (population 144,500), but with a vast rugged area to defend.He was meeting a nation which had only gained its own sovereignty since 1944 and had never had a defense budget or defense forces. It was a nation not under his own command in SHAPE, but eventually to be under Supreme Allied Commander Atlantic (SACLANT). The visit was therefore one of diplomatic and military importance, and in Iceland’s willingness to go forward in cooperating by negotiating for the stationing of foreign troops on its soil in peacetime, General Eisenhower could find a splendid example of the efforts of a small country. The meeting shows General Eisenhower’s understanding of the difficulties that negotiation between small and large countries entails. This was to be a valuable asset to him in his work as Supreme Commander. Furthermore, the trip to Iceland was a kind of preview of his opinions which he was later to give to the Canadian government and the United States.